Having lost my partner Graham in September 2014 I was desperate for support, but visits to my GP in a plea to help with the ‘crazy’ mixed up, utterly debilitating feelings I was experiencing, offered only medication or ‘posh tissues’ (the suggestion from one Doctor), which left me completely baffled as to the lack of targeted information that seemed available. The only other suggestion my GP could offer was a leaflet for Cruse, but it wasn’t available in my borough. Thankfully I did manage to see a Cruse counsellor after a month or so, but I had to say I lived in a neighbouring borough to access the help, as I need to see someone face to face. A phone call, just wanted enough for me. However, this only fuelled my determination to try to resolve these issues that seemed to be faced by the bereaved in sourcing and accessing the early support they need. I was amazed that the outstanding hospitals where Graham was so well treated did not offer a bereavement support service, or even a dedicated room where relatives can go following a death. I heard about a lady whose daughter had died and because there was nowhere for her to go and as she lived some distance away, she had been wandering around the hospital with her suitcase, trying to talk to staff at the reception desk, in a bid to delay having to leave the building. I was told by the Pals office, that they didn’t have anywhere for her to go, surely this can’t be right? At another hospital where Graham was treated, I enquired about their bereavement support provision, but they couldn’t offer any, and in fact they asked if I would like to start a support group there, as they had nothing available to me. Fortunately 6 months or so after Graham died I found the charity Widowed and Young, purely by chance, having randomly googled ‘bereavement’. WAY with just over 2000 members supports those under 50 who have lost a partner and has been a lifeline for me as there certainly didn’t seem to be anything else on offer at the time that could help. I organised my first WAY event, an afternoon tea for ten complete strangers, but we instantly had a shared bond, a kind of unspoken understanding of each other’s feelings as soon as we met and since then I have become London Area Coordinator, organising regular events to bring everyone together in a really fun, relaxed and safe environment. It’s fabulous to be able to share your story with others who completely ‘get it’ and having listened to countless tales of post death problems of ‘being left to sort things out ourselves’, I ran a survey of approx. 300 members nationwide to find out exactly what everyone’s experiences was of the support they received straight after their partner’s death. It was clear from their experiences that there was a severe lack of coherent information provided and it seemed completely dependent on where you lived, as to what type of support the next of kin received immediately after the death, if anything at all, as was sadly the case in many areas. Personally, I am still bemused as to why the hospice who were looking after Graham’s care have never contacted me or anyone in his family since he died. Not a call, not a letter, not a thought it seems. How can that be acceptable? My research over the past 12 months or so has included discussions with a variety of health professionals, GP’s, Consultants, CCG’s and counsellors, as well as academics and MP’s with personal interest around bereavement issues and have interviewed a significant number of people who have lost someone close, be it a child, parent, partner, sibling or friend. It is extremely encouraging to learn that there are some excellent charities and organisations offering outstanding EOL and bereavement support, which should be applauded, however, it is also clear that the provision is sporadic, with varying standards of care and the key I believe that is clearly evident, is the need to ‘join the dots’ and bring everyone together under the one umbrella. I decided therefore that I needed to do something about the disparity that exists in bereavement support in the UK and have recently formed The Good Grief Trust, a charity which aims to try to tackle this issue and help to make significant improvements across the country. Our objective is to find those suffering the raw effects of early grief and signpost them quickly and efficiently to the best support groups, organisations and services in the UK, thereby acknowledging their grief and hopefully alleviating some of the stress, anxiety and sense of isolation that is often associated with the early stages of grief. Commonly the bereaved are left to source the support they need entirely on their own, sometimes in a haphazard way, often through word of mouth, or by surfing the internet which takes a great deal of effort, time and energy and all at a time in their lives when they feel most vulnerable and do not have the physical or mental strength to cope with even the most basic tasks. My understanding of EOL, bereavement and the outstanding work being done in this field is developing all the time and I have been extremely fortunate to meet some inspirational people. Tony Bonser is one such man. We met when we both appeared on BBC Breakfast late last year and it is through his passion for these issues and his fantastic networking skills that I have been introduced to so many interesting, like-minded people, such as Claire Henry whose enthusiasm and determination I admire immensely and who has been so supportive of my vision. I was delighted to be asked to join the PIP Group recently where I met Anita Hayes and was excited to hear about the work she and Paul are doing on the Building on the Best Programme. I have now piggy backed the project to research the provision for bereavement support in each of the ten hospital trusts and plan to collate the data I collect, to create the ‘best of the best’ for inclusion in the ‘Pack’. My first visit was to Basildon & Thurrock Trust where I met Dawn Haigh, their wonderfully compassionate Bereavement Manager. She had recently returned from a visit to Salford and was enthused by the work of Fiona Murphy and her team was aiming to try and replicate some of their projects. 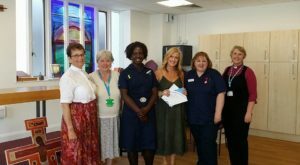 She was particularly impressed by the initiative of placing a flying swan on or near the ward where a patient was dying, so that every member of staff would be fully aware of both the patient and carer’s needs. Basildon have now recently started to hold regular monthly drop in events, with all levels of staff invited from the cleaners to the Consultants to enable informal discussions to take place openly, to voice any concerns around bereavement care and to share thoughts and suggestions for improvements. More positive feedback came from a discussion I had with Dr Karen Groves, prior to my visit to Southport & Ormskirk which revealed that the Trust had an excellent bereavement programme in place, with immediate and ongoing support offered to relatives. Condolence cards were sent quickly following a loss, follow up telephone calls made and even home visits from District nurses, which was all incredibly impressive and I very much look forward to meeting her in person, as the Trust seems to cover absolutely every angle with genuine passion and commitment. I look forward to continuing to map the standard of bereavement provision in all ten hospital trusts on this programme. The Good Grief Trust has been established to prevent those in most need from slipping through the net, which is currently the danger. The potential implications of missing those suffering from severe complicated grief can be extremely serious. Only recently there was a news story of the mother who had lost her son a year ago through suicide. She tragically ended her life the same way, as she could not live without him. I was told a comparable story by a local GP who had a patient in similar circumstances and the practice were struggling to know where to send her for support. I had exactly the same response from three CCG representatives, I recently met at Parliament, who all agreed that they urgently needed the type of information and guidance I was proposing to provide, in order to support their own practitioners. The results of the nationwide research I am currently undertaking will determine the format of a new strategy to provide comprehensive bereavement support information at the time of death, supplied by all front line organisations, i.e. Hospital, Hospice, GP, Police, Registrar, Care Home, Clergy, Funeral Director. I hope to provide a short inspirational film featuring personal grief stories, from both those newly bereaved as well as from those further along their own personal journey, to offer a virtual hand of friendship from others who have been through similar experiences and a friendly ‘face’ to bereavement that is currently lacking. Hopefully by showing the reality of grief from the perspective of those who have been through a loss, explaining and normalising the emotions that may be felt, it will make a positive difference to the impact their grief has on their lives going forward. Film is a powerful tool and as we know for many, peer to peer support is one of the most beneficial ways of dealing with grief. As the UK does not at present have one main portal/database providing bereavement support, we aim to create a fresh new ‘umbrella’ Website, The Good Grief Guide.com which will signpost the user to the countless number of excellent charities, organisations and services for those at any stage of grief, both in the UK and globally, simply, quickly and efficiently, with inspirational and creative content, all under the one ‘hub’ at the click of a mouse.